Not surprisingly, here at The Portraitbooth, we love photobooths! But we have a few problems with the standard 'booth. The photos are usually poor quality, the lighting is less than flattering, and the only record you have of them is a little print that gets lost so quickly. You never know which photograph will have the most meaning to you later in life, and at The Portraitbooth, we believe that every photograph should be the best quality possible -- even photobooth photos! We use the highest quality cameras, lenses, and lights, and we take the time to capture both the beauty of a good pose and the genuine emotion of being with the people who make you laugh the hardest. As fans of classic black and white photography, we know that sometimes color can take away from the emotions in a moment, where black and white can add a sense of timelessness. We spend time editing every photo ensuring the most attractive conversion to monochrome. We also know that sometimes color completes a photo, and adds a life and energy to it that can make all the difference. Color photos are also edited individually for ideal color, contrast, and saturation. Thankfully, we offer both! You can choose one or the other, if you have a preference. Or, you can choose to have two full sets of photos included on your hard drive: one set full color and one set monochrome. While we often encourage our subjects to embrace their inner nonsense, we find that props usually become the subject instead of the people in the photo. People who are well-posed, or who are forced to find their own ridiculousness, are much more interesting than a person with big glasses. Props more often cover up great expressions than they make great photos. Alas! We know that sometimes the group you're with may be more likely to have a good time if they have some props to work with, or there may be items like mustaches or hats that are part of the theme of your event, so we are always happy to incorporate any props that you wish to provide. Since its inception, The Portraitbooth has used a dark gray backdrop to allow for a classic, timeless appeal, and to allow the subjects to pop off the background and give attention to the emotion in the portrait. As such, this is still our go-to option. However! We also encourage everyone to make The Portraitbooth their own, and to match the their own style. We are happy to work with you to find a color or surface that works best for your style. Custom backdrops start at $350. If you can't tell yet, we love timeless photos! We are also very big fans of printing photos. Flipping through prints and albums can be the best way to relive memories, and provides you with something tangible that you can share with other people. 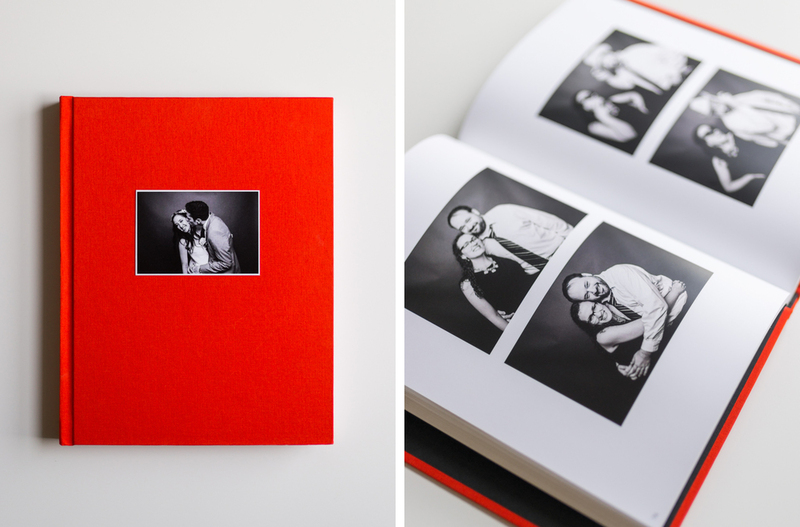 Our albums are offered in 8x8, 10x10, and 12x12 with as many as 400 pages.